Listed below are some of the more notable small cap and micro cap zinc plays on the ASX. First off the rank is Consolidated Tin Mines, which is already producing. After appointing administrators in mid-2016, the company came back 12-months later with a new focus: base metals, including zinc. Consolidated Tin Mines recently commissioned its Mt Garnet processing plant in northern Queensland with first concentrate produced in late July 2017. The company is also undertaking a drilling campaign at its Einasleigh project exploring for zinc, lead and silver. Next off the mark is Red River ResourcesÃ¢â‚¬â„¢ Thalanga zinc project in Queensland, with its mill completing ramp up ahead of schedule in the September 2017 quarter. With an estimated annual zinc production of 21,400 tonnes, the company is anticipating Ã¢â‚¬Å“imminentÃ¢â‚¬Â first cash flow from concentrate sales. Meanwhile, Red River Resources is working on proving up resources at various other targets in the project area. In an attempt to take advantage of the prevailing zinc prices, Energia Minerals is fast-tracking exploration at its Gorno zinc project in northern Italy which was mined in the early 1980s before being shut down. Historic production yielded 55-60% zinc sulphide concentrates and 30-40% zinc oxide concentrates with minimal contaminants. Recent drilling has validated the historic results and in May 2017, Energia reported updated indicated and inferred resources of 160,000t of contained zinc at a 1% cut-off. Energia is aiming to begin producing in 2018. Heron Resources owns the Woodlawn zinc-copper project in New South Wales. Located about 30km south of Goulburn, Woodlawn was mined between 1978 and 1998, producing zinc grading, on average, 9.1%. Heron Resources acquired the project in 2014 through a merger and has been focused on redeveloping the mine since. After securing a $141 million funding package in early September, the company announced on 4 October 2017 it was ramping up project development in order to target commissioning in late 2018. With production a little further away, Venturex anticipates first output from its Sulphur Springs zinc-copper project in the Western Australia to occur in mid-2019. Venturex Resources released a study in February that reveals the project has an initial 12-year mine life and could produce up to 32,000tpa of zinc. Sulphur Springs has defined zinc reserves of 255,000t and a further 740,000t in resources. PNX Metals is conducting a definitive feasibility study (DFS) at its Hayes Creek zinc-gold-silver project in the Northern Territory. The DFS is expected to be completed in 2018. An earlier pre-feasibility study at Hayes Creek forecast annual production of 18,200t zinc. The company is also accelerating zinc exploration at its Moline project, which is about 65km of Hayes Creek. Metals Australia has a drilling campaign underway at its Manindi zinc project in WAÃ¢â‚¬â„¢s mid west, which has a current JORC resource of 70,102 contained zinc. To-date, drilling at the project has returned zinc grading between 6.91% and 16.46%. The drilling campaign is testing multiple targets including the Kultarr resource to target the main zinc mineralisation source. Another zinc hopeful, Pursuit Minerals Ltd kicked off a busy October with a drilling campaign at its Bluebush zinc project in QueenslandÃ¢â‚¬â„¢s north west. Drilling has returned a 20m intersection of zinc and lead. The region is known for hosting zinc mineralisation and Bluebush is 75km from New Century ResourcesÃ¢â‚¬â„¢ Century zinc project, which was the worldÃ¢â‚¬â„¢s third largest zinc mine until its previous owners shut down operations in 2016. As with other zinc explorers, Pursuit MineralsÃ¢â‚¬â„¢ strategy is to advance exploration to take advantage of the commodityÃ¢â‚¬â„¢s rising price. West Africa-focussed Trek Metals is currently investigating the potential for open pit mining at its Niambokamba and Dikaki prospects, part of the Kroussou project in Gabon. Exploration has revealed zinc grading between 2% and 8.6%. The company also has an option to purchase the Lawn Hill project in the Northern Territory, which is close to the Century deposit which has zinc grading 8.2%. In late August, Mithril Resources joined the zinc bandwagon when it applied for a tenement known the Billy Hills project in WAÃ¢â‚¬â„¢s west Kimberley region. The project area adjoins the Pilbara zinc mine, which had a pre-mine resource grading 7.7% zinc and was operating until 2008. Mithril Resources is currently reviewing data and generating targets at Billy Hills while awaiting official granting of the exploration licence, which the company anticipates will be in the next 12 months. Mineral explorer Rumble Resources, is actively exploring its Braeside Zinc-Lead Project in Western Australia. A drilling program is expected to be underway by yearsÃ¢â‚¬â„¢ end. Additionally, Rumble recently announced it had entered an agreement to acquire up to 75% of the Earaheedy Zinc Project, located approximately 110km north of Wiluna, WA. Ironbark Zinc is aiming to develop its Citronen Zinc-Lead Project located in Greenland. According to the company there are over 12.8 billion pounds of zinc defined at their 100% owned Citronen project, making it a world class project if the company can progress it through to production. As one of the near-term zinc producers, New Century Resources (ASX: NCZ) enjoys the largest JORC-compliant resource of 2.6 million tonnes of contained zinc for its flagship Century zinc project in Queensland, Australia. This week, New Century Resources announced it had bagged US$45 million in funding to enable the company to fast-track CenturyÃ¢â‚¬â„¢s development. Little more than a week earlier, New Century Resources reported it had agreed to acquire Century Bull Pty LtdÃ¢â‚¬â„¢s remaining 30% stake in the project. Once finalised, this will increase New Century ResourcesÃ¢â‚¬â„¢ holding in Century to 100%. The company is currently investigating recommissioning the unused processing plant. Other pre-existing infrastructure includes a 700-person camp, private airport with sealed runway, mining fleet, grid power connection, a 304km slurry pipeline and its own shipping port and vessel in Karumba. To keep costs down and remain viable in a lower pricing environment, New Century Resources has begun rolling out solar power generation which is initially expected to offset 70,000 litres of diesel per annum. New Century Resources utilities manager Michael Pitt said the solar infrastructure enables the company to meet its environmental objectives as well as offset power costs. Peru, the new zinc frontier? Peru-focussed Inca Minerals (ASX: ICG) reported last Friday it had intercepted zinc grading 40.92% at its Cerro Rayas project in the country. Sampling at previous small-scale mines had returned assays in excess of 30% zinc. Inca MineralsÃ¢â‚¬â„¢ managing director Ross Brown said the Cerro Rayas was proving to be an Ã¢â‚¬Å“excitingÃ¢â‚¬Â project for the company. It looks like Inca Minerals may be onto a good thing, with Swiss-based heavy weight Glencore Plc (LON: GLEN) announcing last week it was increasing its stake from 7.68% up to 28.07% by purchasing between US$531 million and US$956 million shares in PeruÃ¢â‚¬â„¢s largest zinc miner Volcan Compania Minera SAA. Due to the quality of its ore deposits, Volcan is considered one of the worldÃ¢â‚¬â„¢s lowest cost zinc producers, making it economically viable during lower pricing environments. Glencore is happy to make hay while the sun shines on zinc prices. Should clouds gather, however, its move to consolidate the market through control of Volcan's pits represents a smart insurance policy. Miner and commodities trader Glencore (LON:GLEN) is buying 26.73% of the voting shares in Peru's largest zinc producer, Volcan CompaÃƒÂ±ÃƒÂ­a Minera SAA, in a deal worth at least $531 million. The Swiss company will pay $1.215 per class A common share, which will help it boost its current 7.68% interest in Volcan and which could cost Glencore as much as $956 million, depending on the level of acceptances. "Volcan's operations are located in the richest polymetallic production area in Peru, producing some of the highest quality zinc concentrates," it said in the statement. "The transaction will provide an increase and extension of Glencore's zinc production profile and the opportunity for synergies with Glencore's existing Peruvian zinc operations," it added. After the closure of the deal, Glencore Ã¢â‚¬â€ which already is one of the worldÃ¢â‚¬â„¢s largest zinc producers Ã¢â‚¬â€ will hold between 44.84% and 66.30% of the total class A shares and will have an economic interest in Volcan of between 18.98% and 28.07%. The company, a Volcan shareholder since 2004, said it expects to make the offer by no later than October 27 and that it hopes to complete the deal in November or December this year. Glencore, one of the top miners that swung back to profit this year on the back of stronger commodity prices, will fund the deal out of its existing cash resources. Zinc, used to coat metals such as steel to prevent them from rusting, was one of the best performing commodities last year, climbing up 60% as a few top mines, such as Lisheen in Ireland and Century in Australia, closed down. At the same time, top miners of the metal, including Glencore and Nyrstar, suspended some production. It has extended its gains throughout 2017, with prices hitting a 10-year high of $3,292 a tonne on Tuesday, boosted by increasing concerns over production in China amid the countryÃ¢â‚¬â„¢s ongoing anti-pollution crackdown. Founded in 1943, Volcan is mostly engaged in the exploitation of silver, zinc, copper and lead, but also operates hydroelectric power plants. Casting zinc. Photo by Magic Foundry, Flickr. A new report from BMI Research states that the global refined zinc market will remain in deficit over the next few years as producers curb output due to an ore shortage. According to the document, zinc refiners, in particular those in China, will continue to scramble to secure concentrate over the coming quarters. Such shortages are explained by production cuts implemented in 2016 and the fact that two major mines went offline. 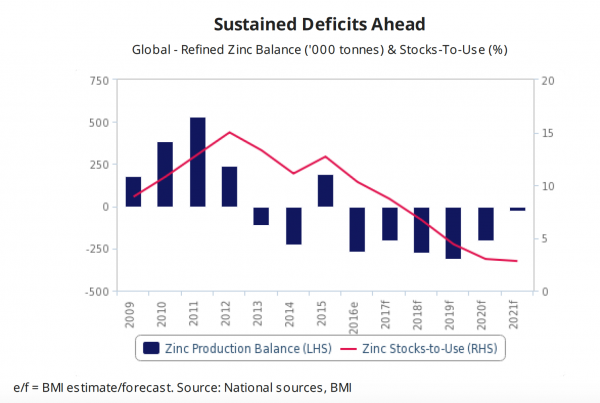 BMIÃ¢â‚¬â„¢s forecast is, however, more positive when it comes to the long-term outlook for zinc. Between 2017 and 2021, the firm expects global refined zinc production and consumption growth to average 1.9% and 1.6%, respectively. Ã¢â‚¬Å“The slowdown in ChinaÃ¢â‚¬â„¢s steel sector will weigh on global refined zinc demand, leading to smaller deficits toward the end of our forecast period by 2021,Ã¢â‚¬Â the report reads. The research firm predicts that as new projects come online and prices remain high, zinc smelters will gradually ramp up output again. The prospect is that they reach 15 mnt by 2021. Similarly, India's zinc production should rise and average 6.5 per cent annual growth over 2017-2021. In terms of demand, the report states that the subdued global steel production outlook indicates that the need for refined zinc will decelerate worldwide. Over the period that ends in 2021, annual growth is envisaged to be 1.6 per cent. In past years, the annual global refined zinc demand rose by 2.2 per cent. 619 kt in 20 7 to 631 kt by 2021. Zinc is on a tear. After aluminum, the metal used in galvanizing steel and sunscreens has been the best performing of the London Metal Exchange's six main contracts so far this year. Over the past week, the price chart has gone vertical -- busting through the $3,000 a metric ton level for the first time in a decade with a 5.4 percent jump Wednesday.ZINC, YTD+20%Zinc's moment in the spotlight has been a long time coming, but bulls should watch out -- it may be short-lived. As Gadfly has argued before, Glencore's continued reluctance to ramp supply back up is a sign that the current strength of the market may be built on shakier foundations than the bulls are prepared to admit. Should China's industrial boom peter out after the party congress, the world may once again find itself with more zinc than it needs. Looks at how zinc should benefit from rising commodity prices, productions cuts, minimal new mine development and growth in demand. Former owners MMG Ltd yesterday said it would transfer the mine to a company specialising in mine rehabilitation. The company, Century Mine Rehabilitation Project, in turn had sealed a deal with Attila to fund rehabilitation at the mine, which shut down in 2015. [It has] progressively acquire[d] the mine including a processing plant, mine site, slurry pipeline and airport. Smaller companies such as Atilla often take over mines at the end of their life to extract remaining reserves, a process known as "wringing the rag." Attila would invest $10 million in restarting operations as well taking a stake in the company rehabilitating the mine. Century, which was one of the largest zinc mines in the world, began production in 1999 producing both zinc and lead that was shipped to a port on the Gulf of Carpentaria. Attila managing director Patrick Walta said there was still an estimated $2 billion worth of zinc left at the mine. "We expect to be operating until 2050," Mr Walta said. The company said the reopening of the mine would initially involve reprocessing of tailings allowing much of the rehabilitation to be achieved through new cash flow. There also was potential for further exploration, including 783 square kilometres of mining licences and permits. The mine produced on average 475,000 tonne of zine per annum and 50,000 tonne of lead each year during its history. The lack of quality zinc stocks on the ASX has been a frustration for investors who have watched zinc prices double over the past 18 months to ten year highs. But that should change at 10am Thursday when New Century Zinc lists on the ASX. The company is built around Queensland's Century Zinc mine, which was acquired from Chinese giant MMG in March. More than $5 million was raised from investors for the zinc tailings project, which is also an infrastructure play given it has ownership of the 304 kilometre pipe that carries zinc concentrate to a port which the company also owns. Several other zinc juniors plan to use that pipe to export their product, meaning New Century should do a nice business in clipping tickets, not to mention the multiple zinc prospects on the lease. The New Century team includes former Syrah boss Tolga Kumova, who has already been involved in one of this year's very few successful initial public offerings, Alderan Resources. there's this year's posterboy name again.